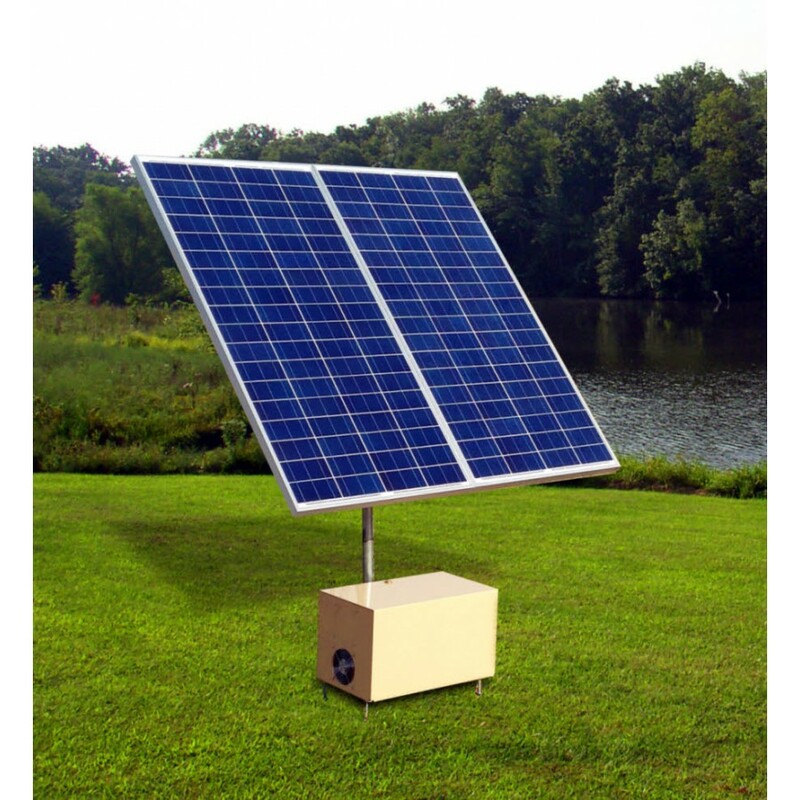 These high-quality solar-direct systems are designed for ponds up to two acres in size. The DC air compressor can handle depths up to 15' and will provide quality aeration during daylight hours when the sun is shining. These systems have no batteries making them a good choice where aeration is essential but the budget doesn't allow for large battery back-up systems. 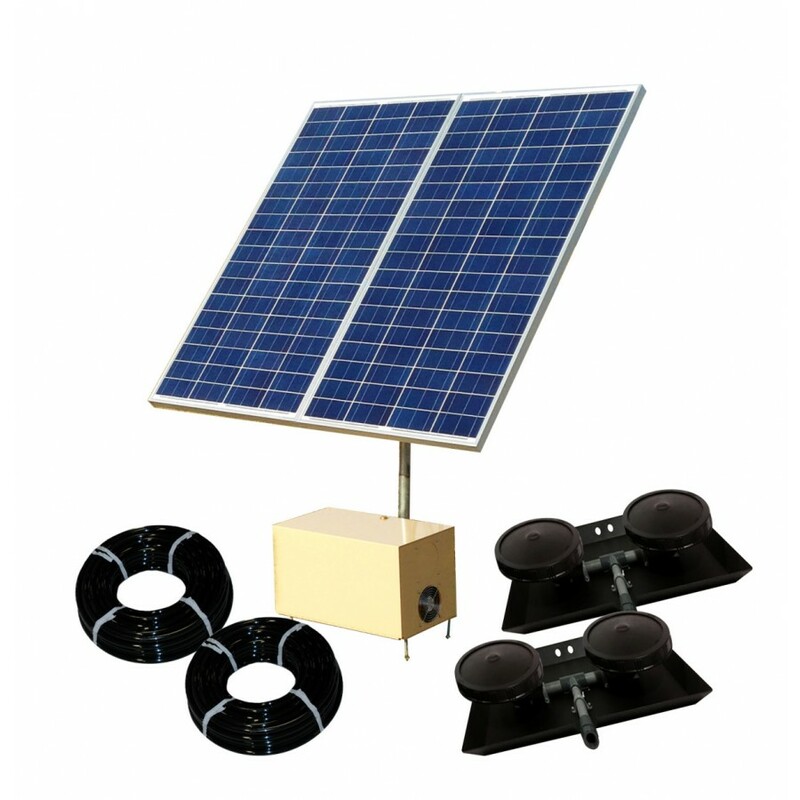 These plug and play solar systems come complete with high efficiency solar panels, energy efficient compressor, high volume cooling fans, fully adjustable manifold housed in weatherproof ventilated cabinet. Diffusers are micro-bubble technology, self-cleaning, non-clogging membrane diffusers emit millions of tiny bubbles that increase dissolved oxygen levels while eliminating stratification, improving water quality and clarity. 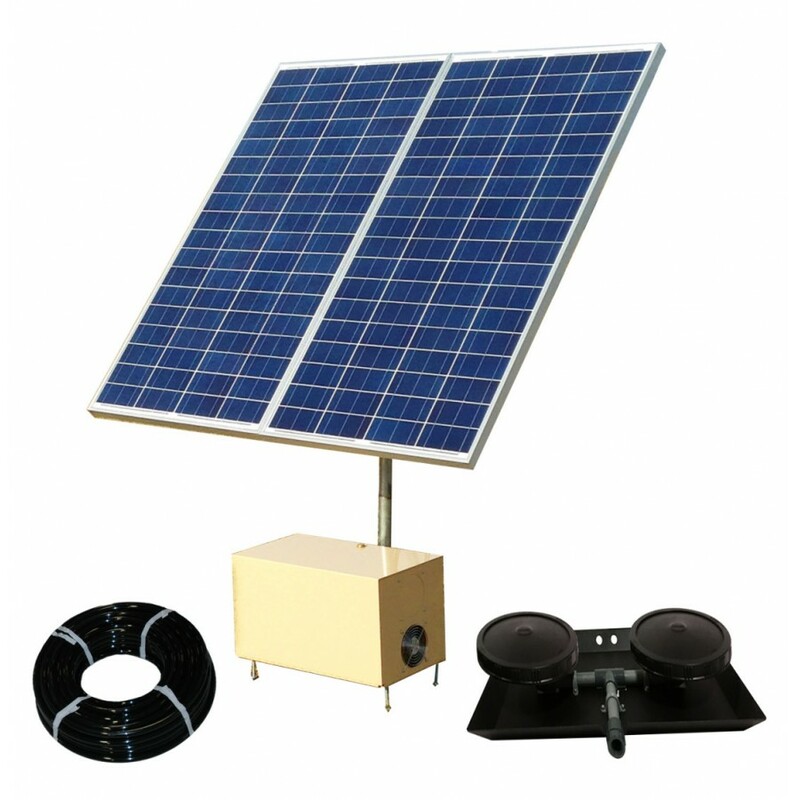 The systems are available as solar direct systems with 12 volt direct current pumps or as a hybrid solar/ac system that will operate with solar power when possible but will automatically switch to AC power when there is not enough sunlight to operate the DC pump. Solar modules are designed specifically for use in OFF GRID applications. Pre-cut, pre-drilled mounting frames to connect 2 panels in parallel. High quality adjustable angle mounting bracket with powder coat finish. Includes quick cable disconnects to make assembly much easier. Includes a 5’ Galvanized steel mounting pole with instructions. High quality weighted airline that sinks to the bottom of your pond. Low psi rubber membrane diffusers with stainless steel hardware. 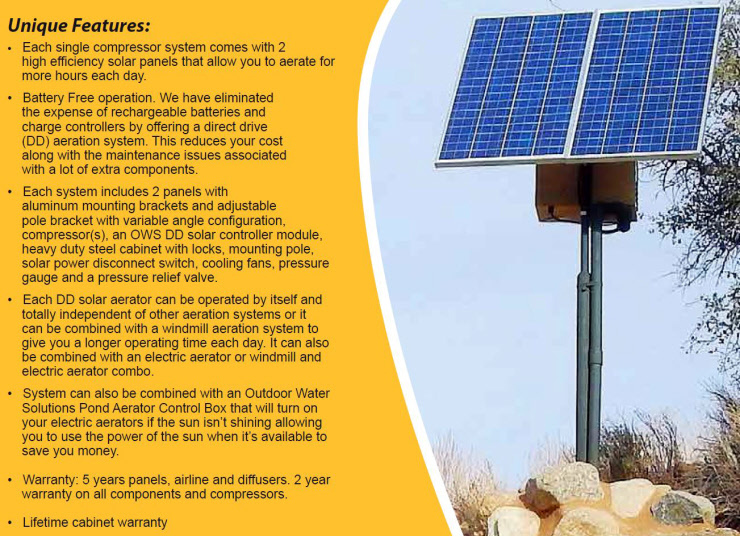 Outdoor Water Solutions DD DC solar compressor rated at 2.8 CFM. Aerates ponds up to 15’ deep with its vertical piston design. Powder coated steel cabinet with secure locking system. Cabinet includes either 1 or 2 high efficiency DC fans. Mounting feet and a post mount kit included. Solar disconnect provided for safety purposes when working on the unit. System includes a pressure gauge and high quality Pressure Relief Valve. Each single compressor system comes with 2 high efficiency solar panels that allow you to aerate for more hours each day. Battery Free operation. We have eliminated the expense of rechargeable batteries and charge controllers by offering a direct drive (DD) aeration system. This reduces your cost along with the maintenance issues associated with a lot of extra components. Each system includes 2 panels with aluminum mounting brackets and adjustable pole bracket with variable angle configuration, compressor(s), an OWS DD solar controller module, heavy duty steel cabinet with locks, mounting pole, solar power disconnect switch, cooling fans, pressure gauge and a pressure relief valve. 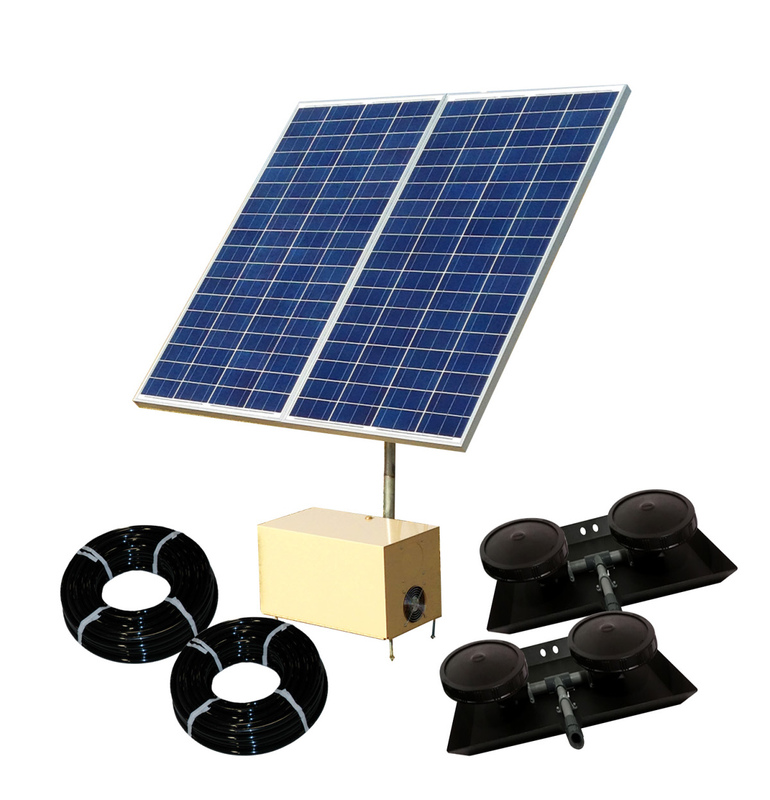 System can also be combined with an Outdoor Water Solutions Pond Aerator Control Box that will turn on your electric aerators if the sun isn’t shining allowing you to use the power of the sun when it’s available to save you money. Warranty: 5 years panels, airline and diffusers. 2 year warranty on all components and compressors.